According to Ella Fitzgerald, in the summertime, “the livin’ is easy,” and for students and staff alike, it is an opportunity to recharge, refresh, and reflect. However, for others, it is a prime time to pursue activities for which one does not have time during the hurly-burly of the school year. This past summer, many WHSAD students took part in internships and experienced the potential rigors and rewards of the workplace. Other students took advantage of the new SYEP program and worked for various organizations, gaining valuable experience as well as a nice paycheck every couple of weeks. In its first year at the school, the SYEP program was a major success as all 150 spots allocated to WHSAD were filled and retained over the summer, and 26 students were offered positions after the program ended. Below are some insights from students involved in internships and SYEP along with information from Ms. Wilson and Ms. Gordon, the internship and SYEP coordinators, respectively. Antonio Perez and Jeremy Ceballos, WHSAD’s student correspondents, conducted the interviews. 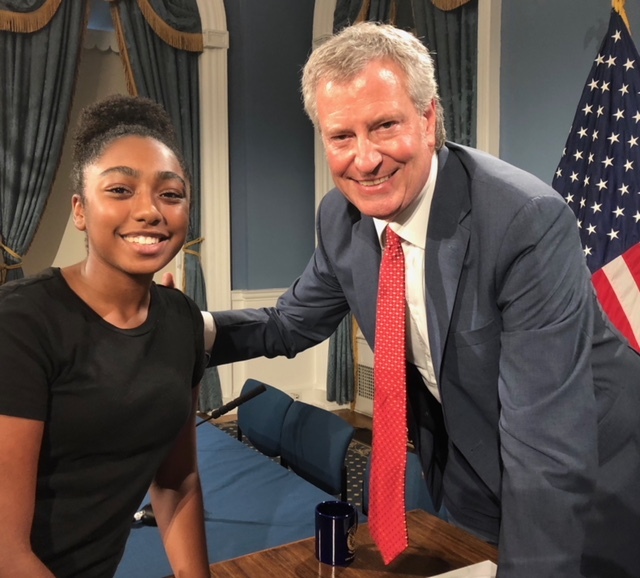 Through her internship with Athena Consulting, Ariana Lowery met many important New York City figures, such as Mayor de Blasio. Ariana Lowery, a WHSAD junior, had this to say about her summer intern experience: “This summer I was blessed with the opportunity to intern at Athena Consulting Group. The process of interning wasn’t as tedious as I had initially presumed. I was originally contacted by Ms. Wilson, and I was told that they were looking for a woman intern because they are a woman-based firm. Diana Reyna and Laura Imperiale from the Athena Consulting Group interviewed me and said I was a perfect fit for the job. I also went to Gannett Fleming, an Architecture Firm that Laura’s husband Michael Shamma manages. I was able to shadow everyone for the day and saw that the firm was taking on a project for the New Jersey Turnpike, which was pretty amazing. I would say that in the long run, the job did influence me. It really helped me to get a feel for the field and decide whether this was something that I wanted to pursue in college and beyond. Because of the job, I was able to learn a lot about communicating with people and working efficiently in certain environments. If given the opportunity, I would wholeheartedly accept the offer and work with them again. While I did have expectations for the internship, in almost every aspect my expectations seemed small compared to the wonderful and life-changing experience which became my summer internship at the Athena Consulting Group. Because of this internship, I was able to meet so many great people, including Mayor Bill de Blasio, NYC Schools Chancellor Richard Carranza, and Antonio Reynoso, councilman for the 34th district. I went to City Hall, an amazing experience, and I was able to shadow engineers and architects to see what they do all day and learn about the programs that they were working on. Fortunately, due to my amazing education and experience here at WHSAD, I was already rather knowledgeable regarding most programs. Through my shadowing experience, I was able to learn BIM, AutoCAD, and Revit. One of my most cherished experiences occurred on July 24th when I went to the Regional Transportation and Climate listening session in New York City at the Kimmel Center. This stood out to me because we were speaking about regional transportation and utilizing ways of lower carbon transportation to get around the city and getting more cars off the streets. We were discussing possible solutions to this issue and split up into smaller groups to discuss this. I was able to communicate with people who shared similar experiences with me; even one man who takes the A train from Ozone Park to Manhattan, which is how I get to school. All and all I am extremely grateful for this opportunity and I would like to thank everyone who made this a possibility. Especially Ms. Wilson for reaching out to me and connecting me with Athena. Also Diana Reyna and Laura Imperiale from Athena who helped me in every way possible and showed me the ways of the field. Finally, I would like to thank the WHSAD community for being such an amazing environment not only one in which to learn but also one that prepares us for the future, which is what this internship helped me do. Ms. Wilson, WHSAD’s internship coordinator, offered her thoughts about the internship experience. “The process of sourcing intern host companies usually begins in the spring, around early March. Everybody who has expressed interest in hiring interns lets me know and I publish the list for everybody. Then anyone who is interested is welcome to apply. It’s similar to a checklist where you just pick which ones you are interested in and then I send out their resumes to all their employers. The employers then come in and interview people who are interested in the position. I’ve always compared it to when students are picking their high schools, where you have to put a list and go through a matching process. This is similar to how it works with interns in that the employers come back and tell me who they are interested in hiring and then the students tell if they had a bunch of interviews who they are most interested in and we go from there. Sometimes in the case of the Athena Consulting Group, which is one of our new partners this year, companies come on board a little later. With Athena we had to move with the process rather quickly to get it all done in a very short amount of time. They were searching for a candidate with a specific and certain set of skills, so in this case, I knew based on the students who had already applied for things that there was someone who had those, and so I was able to make that connection. So sometimes that happens to where things come up and if I already know who is interested I can then match the students together. All of the students and experiences stood out because they are all very different. 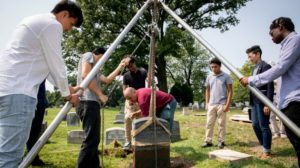 WHSAD students assist in the refurbishing and resetting of headstones at Green-Wood Cemetery. 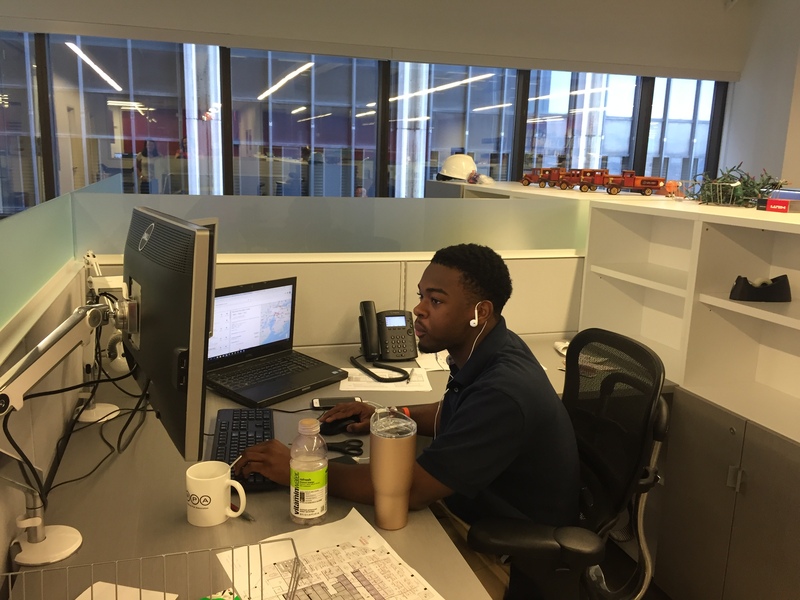 Reginald Huggins enjoyed first-hand experience working for Silman, one of the city’s top engineering firms. 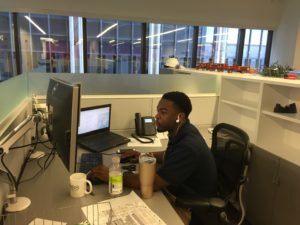 Reginald Huggins provides some thoughts regarding his internship at Silman Structural Engineering Firm. This summer of 2018 I spent six weeks interning at Silman Structural Engineering. As soon as I got there I was introduced to everything about running a firm and what a structural engineering firm’s days look like. I saw everyday different projects go in and out the office with some of the biggest names in the country working with Silman. I helped out the engineers by going with them on site visits, looking for old plans in architecture archives, and helping them file some of their projects. I would spend most of my time talking to the engineers and other staff about projects and the different facets of structural engineering that would get me more inclined to study in the field. One of the many projects I helped with was at the Cathedral of St John the Divine. The engineers, Jessica and Derek, took me on to a site visit to see how the scanning of the ceiling was going and to see if there were anything major they had to seriously worry about, which there wasn’t. There were many takeaways from this summer that enlightened me and gave me insight to structural engineering. For example I didn’t know that the a structural engineer works with artists and sculptors at museums like the Metropolitan Museum of Art for their exhibits to make sure they don’t fall down. Also I learned that most structural engineers don’t get to see the finished project. They usually only get to see when a project is almost completed or just when the architect says that the engineer isn’t needed anymore. I also didn’t know how a firm works and the lifestyle of a firm. While summer hours aren’t as intensive as fall, winter, or spring hours, I still had an understanding of how busy a firm can become and the work that it takes on both parts as the staff and the engineer to complete a project. I thank my bosses Lyn SanPedro and Joey Guzman for helping me and choosing me for the opportunity of a lifetime to work at a firm at the age I am now. I also want to thank Jessica, Derek, Brittany, Jim, and Amy for getting me out of the office and allowing me to see the different projects they were working on. Lastly I want to thank Elizabeth (Liz) and Kemroy for keeping me busy while at the office, helping me understand how the office works, and making sure I enjoy myself and not get too overwhelmed with the workload I was given. Thank you Silman for being one of the highlights of my 2018 Summer. 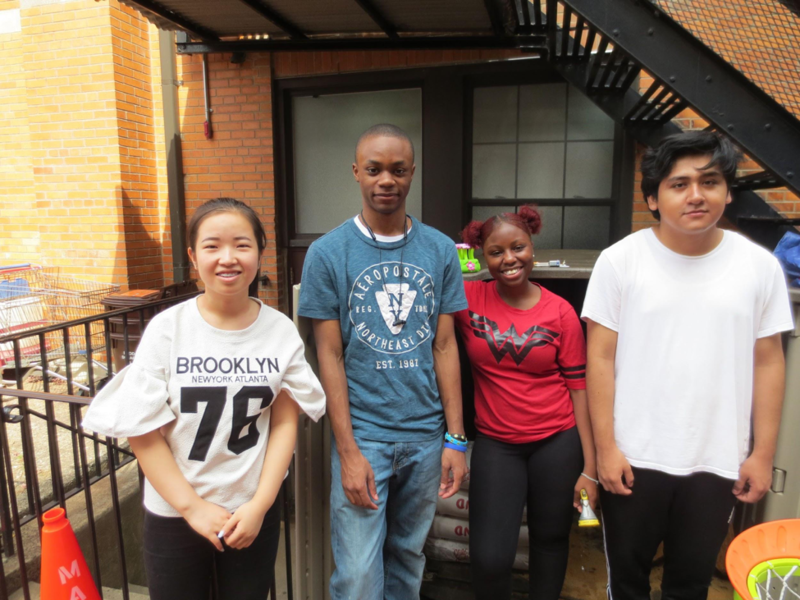 In addition to internships, this summer students had the opportunity for gainful employment at various organizations through the SYEP program. Below, SYEP coordinators, along with students, discuss the goals of the program and what the specific experiences entailed. Ms. Gordon and Ms. Sutton had this to say about SYEP: The incorporation of SYEP into schools is a new thing, being branded as a school based program. It was initially a test run and seemed to have been successful throughout the summer. To acquire an internship with SYEP, you need to be able to fill out the application accordingly and provide the required documents. At first the overall experience was challenging because you wanted to get to know the students. Afterwards it became a breeze because we were able to maintain a relationship with the kids, so it made it much easier to get by. We were able to learn and understand people individually, so it made it much easier in that sense. And out of the 150 participants that actually applied for SYEP, only about 6 of them didn’t sign up and complete the process. That means we had an over 90% attendance rate. The younger youth were able to come and complete the workshops and came every day on time. Out of the overall experience 26 participants actually gained permanent employment. It was very successful and out of the other organizations they were raving that our students and organizations had the best kids and that they’re eager to be apart of the program because of its success rate. We develop a relationship with not only the kids but also the work site supervisors which was definitely important in having that high success rate. To increase the success rate, students could tell other kids that it’s something positive and to spread the word and really get it out there. I know that everyone has their challenges, but we’re willing to work with them to make sure that they’re comfortable to make it through. The importance of the program is that people who for their first time are coming into the program are able to apply the skills. They now have skills which they didn’t have before, which will help to furnish their resume. That was one of the most successful parts of the program because now we can help young adults and especially help them understand about working and ways to furnish their resume. Now they can also get an idea as to what their parents have to go through and even find out more about themselves through career exploration and financial literacy. All of these different functions of the program help give you an idea also how to budget, which is an important thing all young adults should learn to do. 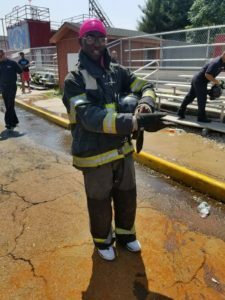 Trevon West experienced a firefighter’s New York City summer as he donned the gear and took on demanding training exercises during his SYEP work. WHSAD students help make the lives of young children more exciting by improving the confines of The Mount Carmel Early Childhood Center. Javon Bennerson, a WHSAD senior this year, enjoyed a fruitful time working with peers to improve the daily experiences of children. Below, he provides his thoughts on his experience. The summer vacation of 2018 was the first time I worked with SYEP. I chose to be assigned to child care, so the nice people at Community Counseling & Mediation assigned me to work at Mount Carmel Early Childhood day care center. This was where I experienced my first paid work internship, and, to be honest, I was nervous. I would say the most difficult part of working with SYEP was correctly signing up my name every day with a pen. I worked with two friends and a recent graduate from my school Williamsburg High School for Architecture and Design. At our worksite, my co-workers and I took the lead from our boss, Ms. Moora, and completed everything she told us to do. My co-workers and I worked on a few big projects to improve Mount Carmel. The completed projects include placing playground rubber tile on newly spaced concrete to expand the children’s play area, building flower beds to expand the garden for the kids, painting the daycare, and much more. Doing such rigorous activities most importantly taught me useful skills I can put to further use in the work field or school. One skill I learned was how to work effectively with others. This was because with and my three other co-workers and me it was ideal for all of us to work together or we would have never finished our intended projects. In SYEP working hard, especially during the summer heat, makes it even more satisfying to earn pay for a hard day’s work. Now that the school year has started I have no problem working with others, luckily that’s my strong point anyway. My boss told my co-workers and me that she wouldn’t have a problem writing a letter of recommendation for other jobs or even college to show how efficient we are as hard workers. On another note, the SYEP process is worth the time for the experience and the pay. Especially for the next wave of young hard workers.